The particular interest of the documentary was the ‘inefficiency’ of the railway and how it is kept running by the everyday people that work on it. Sean often tries to track down and talk to the mysterious Chinese investors in the railway, and is blocked by that mysterious almost divine power of African bureaucracy. It was interesting viewing for me, because I no longer have the simple view of a European, I have a fair amount of African mixed in as well. Facts that seemed to be presented as shocking such as lack of maintenance, long hours worked, how things are ‘just’ kept running and the like, didn’t really shock me at all. I actually found it quite amusing that someone would expect these things to be solved and running well at all. It really highlighted to me the chasm of difference between the UK and Zambia, in particular in terms of expectation. Every time a fact was highlighted as surprising, it simply struck me as normal. In the UK we expect so many things to work out OK. The pensions strike action is a good example of that. Whatever side of the fence you sit on, the driving force is an assumption that life should be fair and equitable. If it isn’t, well we can do something about it. That is simply not the case in Africa. Many workers are not paid on time, conditions can be terrible and life very hard. However, there is a ‘working with’ or ‘acceptance’ of those facts, that is actually admirable. You could call them enduring qualities. Perhaps an area in the Church where you see this, is where we blame God. We expect everything in our life to be well. We don’t expect anything to go wrong. However, life is not like that is it? And yet, when things do not go well and our expectation is crossed, we blame God. I have never found an African who does this, certainly not openly…… interesting isn’t it? Africa causes me sometimes to be irritable, but I think I have learned to have more realistic expectations in life. Maybe we all should take that lead and we would spend more time enjoying life, rather than fighting against something to simply being dissatisfied. 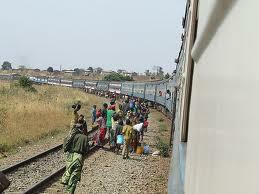 So no, I’m not a trainspotter, but I did learn something from the African Railway. There I was taking my father down to Wales to spend a couple of days with him. I hadn’t seen him properly and with me going away, I thought it was high time we spent some time together. Somewhere near Ruthin, I was playing around with my radio and came across Radio 4’s Lent Series talk. http://www.bbc.co.uk/programmes/b006xp1x I was very surprised to hear a programme about God, and more than that, a Christian programme about God. So there I was driving through the dark welsh countryside listening to a sermon on the radio and it’s message, well very simple but very profound, to listen. The sermon was being presented as part of the Lent talks on Radio 4 and was presented by Sister Elizabeth Oddard, a Carmelite Sister. Christianity can be very busy. Is this the way it is meant to be? Religiosity is busy. The rules and regulations of obligation can pull at our time, personal and family life and ultimately kill the faith, that we profess to begin with. Is that ‘christianity’ then indeed true Christianity? I would venture not. Faith is not meant to be a pressure cooker, driven by targets, driven by dreams and desires. No! I don’t believe it is ‘driven’ at all. I do believe it is the response to hearing the voice of God. That is the golden rule for all of our lives. That is what faith is about, to not listen is to be religious and dead. To listen is about bringing our lives to the center of God’s plans, not looking for God’s blessing on our plans. What are we wanting for our lives, a self centred utopian life that blesses us or a life of obedience, sacrifice and constantly listening to the will of God. The two are certainly very different. God’s voice will never take us into ourselves, but always outside of ourselves. He is a God whose human form was Jesus, the servant King who went outside of himself, who gave himself for our sins. It is a contradiction in terms for God to make us more centred on ourselves in our faith. I see this in churches and in Christian organisations. Who in the end cares about Dignity for example? In eternity Dignity will not mean anything, but the lives of those we touch, when we listen and go outside of ourselves, that will last, that will last forever. The same is true in our Churches. We shouldn’t for one minute build our church building, ministry or anything as a prime objective. No, the key thing is to listen and to push the Kingdom of God into everywhere that the Lord directs you. This approach is messy certainly, unpredictable and not easily planned. Who cares though? It’s efficacy is not based upon the whims of a person, but the direction and work of God, so is it effective? yes! more can be achieved in one action that in ten thousand. If it hurts, if it involves you becoming lower and less well known, it is almost certainly the voice of God. As you decline, he will ascend in your life in heavenly power. It all begins with listening. I’m pretty fed up with the manufactured go getting Christianity that does not make time to listen. I personally want to develop this discipline above all others because it is the first step to obedience. Psalms declares that “obedience is better than sacrifice”. I want this to be a well spring of life that will flow within me and touch many others. Listen. Make time to Listen.